If you need only a small part of an image, you can just crop it in any image editor, without any difficulties. However, things can get a bit tricky if you need multiple pieces from the same image. Cyotek Slicr was created to satisfy this particular need. It lets you extract multiple slices from the same picture in a single run. Furthermore, you can save those slices in different formats, with different names and metadata. Installing Cyotek Slicr is a straightforward operation. It doesn't involve any difficult configurations, but the wizard still lets you choose what components to install. The application is compatible with all popular Windows versions and it doesn't have any special requirements. Importing an image, drawing one or more boxes over it and clicking a button is sufficient to slice it up, but you can do much more along the way. You can find several tools for drawing and adjusting slices on a toolbar. Additionally, the software provides a series of output options, a project explorer, as well as options for adding custom fields and comments. You can find them on separate tabs, on the right side of the interface, next to the image preview. Slices can be exported in PNG, BMP, TIFF or GIF format, with a custom filename format. What's more, the software lets you export each slice with different settings. The slices you draw can be found in a list, in the project explorer. Double-clicking a slice will bring up a tabbed properties panel, on which you can choose a format and file name, for that particular slice. Despite its rather simple appearance, Cyotek Slicr has other advantages as well. For example, the software lets you define sizing and spacing criteria for an automatic slicing process. Furthermore, Cyotek Slicr lets you slice images through a command line console and it provides support for various plug-ins, which can extend its functionality. 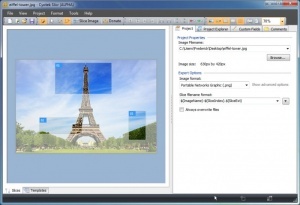 When it comes to slicing images, Cyotek Slicr places numerous possibilities at your disposal. You can extract multiple slices from the same image. The software lets you export individual slices in different formats, with different names and metadata. You can download Cyotek Slicr free here.